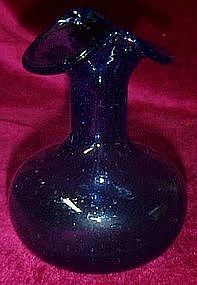 A neat little hand blown vase in cobalt blue. Millions of tiny little seed bubbles throughout. Measures 5 1/4" tall and in in perfect condition/. Ground pontil and wear to the bottom. This appears to be an oldie!